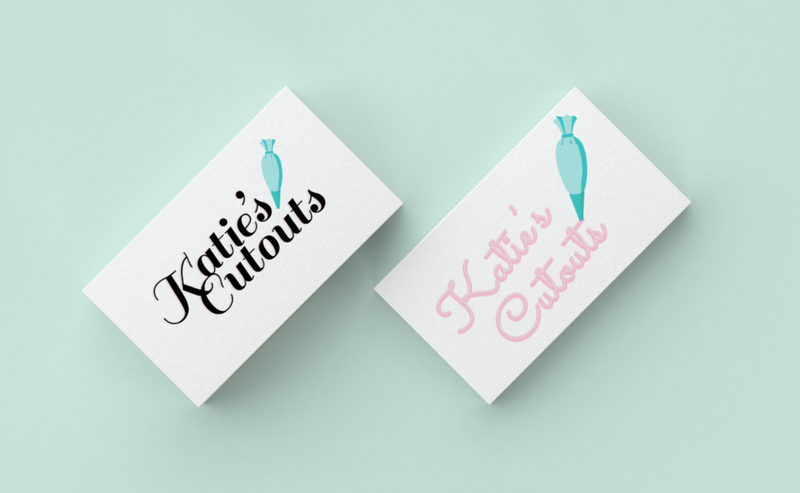 Katie's Cutouts Logo Redesign — Kat Curling Design Co. This first option has 3 versions that are very similar but with different font choices. They are a very classic logo w/ elements designed into it create a more modern vibe. The 3 different font choices and colors provide more of a three dimensional feel. This logo is very strong and recognizable. It will make a great sticker, sign or for a t shirt. I love the font used in this. It’s very classy but fun. Below you will see the other variations but with another type option. This option is more of a classic option that will definitely be timeless. It has the framed element you like paired with fun whimsical type. This would look really nice as a sticker on packages and boxes. It’s very easy to visualize how this would be use online, on stickers, and even signs or a t shirt. The great thing about this logo is that you could do it in colors from your brand palette and be more versatile. I wanted to present an option that was a play on the 50’s kitschy style of baking and actually incorporated a tool you use every day in your decorating. It’s fun and playful and eye catching. The type on the second version gives off a 3Dish effect that I think will look amazing on stickers, social media etc. I really like this option because it will catch people’s eye as well. First, sprinkles! I love the sprinkles we originally used on the business cards. Since we already used those elements I thought it would be a great idea to build on that concept3 I think it looks whimsical enough to play on the bakery / cookie fun w/ the sprinkles without being cheesy, corny or cheap looking. The font it very modern and feminine but stays away from the trendy overdone cursive fonts out there. If you are wanting to go with a bright logo that is eye catching and fun, this would be a great choice. We could use the sprinkles and colors in many ways in your packaging, stickers, etc. Lots of possibilities to build on the brand. This option stands apart from the others in that I wanted to present something w/ the floral and frame shape elements your liked in a way that would be a little bit more timeless, without being to trendy. It keeps the original font I chose but with a more classical look to it. I really like this lettering and coloring as an option with the circle shaped sprinkles as a fun option. This type offers more of an Art Deco, structured look. Again with the colors and sprinkles we have a lot of possibilities to build on the branding.